aData from Godfrey et al. (2002:136) revised to include additional species. Data for sexes displaying insignificant differences in mean canine height (p > 0.05) were pooled. Due to the dearth of skulls of Megaladapis with associated canines, the index value for this genus was estimated on the basis of unas-sociated teeth. and resting between feeding bouts would serve further to reduce the energy budgets of giant lemurs (not unlike Indri indri in the wild; Powzyk, 1997; WLJ, personal observations). If all or most of them were diurnal (Jungers et al., 2002), they may well have followed the example of many of their living relatives in Madagascar, and indulged in sun-basking to rev up their relatively sluggish metabolisms. Figure 1. 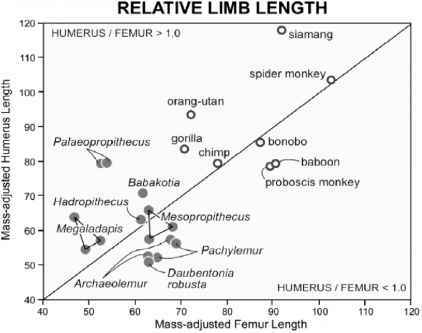 When limb lengths (humerus and femur) are adjusted for body size (i.e., length divided by the cube root of body mass), it is apparent that large-bodied subfossils have a fundamentally different Bauplan than large-bodied anthropoid primates. The subfossils possess relatively very short (and very robust) limbs regardless of locomotor adaptations. Even the most suspensory species (e.g., Palaeopropithecus) have relatively much shorter limbs than antipronograde anthropoids. The most terrestrial of the subfossils, the archaeolemurids, are also clearly distinct from baboons in this regard. none of the subfossils is designed for speed of locomotion, including those belonging to the most terrestrial clade, the archaeolemurids (Jungers et al., 2005a). To be fair, however, dramatic adaptations to speed (cursoriality) are quite rare among mammals, and most animals optimize their anatomy instead for reducing locomotor costs (Christiansen, 2002). The palaeopropithecids (sloth lemurs) evolved extreme suspensory adaptations that converged on true sloths of South America, a mammalian group not well known for either speed of movement or energetic profligacy! Huge grasping feet (and hands) on relatively short limbs of the large-bodied (but primarily arboreal) Megaladapis imply slow climbing in the trees and awkward and deliberate movements when these large folivores ventured to the ground to travel (Wunderlich et al., 1996). Very large body size (similar to male gorillas) and the (admittedly few known) skeletal remains of Archaeoindris are also consistent with a slow-moving form of locomotion, whether it occurred in the trees or on the ground. 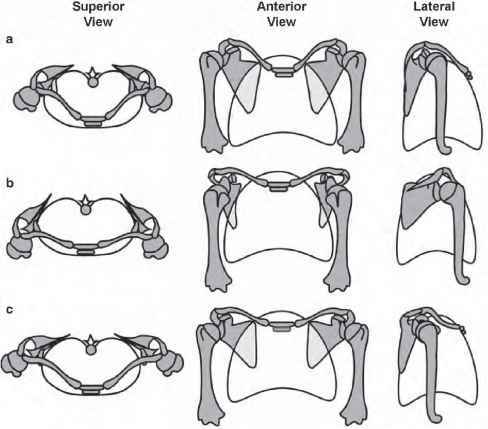 Recent work on the comparative sizes of the semicircular canals in giant lemurs largely corroborates these reconstructions (Walker et al., 2004). Relatively large canals are found in quick-moving, "jerky" taxa like leapers, whereas cautious, slow-moving lorisines tend to have relatively small canals (see Spoor, 1993). Megaladapis and the sloth lemurs also possessed relatively small canals, and this implies slothful locomotor repertoires. The size of the canals of Archaeolemur, however, is well predicted by the scaling relationship seen in other primates, and this could translate into a more active lifestyle and faster locomotion than seen among the more arboreal extinct taxa. Perhaps giant lemurs economized their energetic needs by living in small groups with spatially limited resources, thereby reducing travel costs. If sociality is indeed correlated positively with encephalization (Dunbar, 1992, 1995), the relatively small brains of giant lemurs (Jungers, 1999) might suggest they lived in rather small groups, especially the largest taxa. This inference is complicated by the observation that their brain-size/body-size scaling is remarkably similar to that documented for social carnivores (Gittleman, 1986). Regardless, giant lemurs faced the extreme seasonality of resources experienced by all Malagasy primates (Wright, 1999), and it seems reasonable to conclude that they were also were forced to evolve energy-conserving lifestyles and anatomies.